Thailand is known for it’s wonderful sights and it’s cheap prices. Before you fill your bags with every item, know that you can buy a lot of items for super cheap. 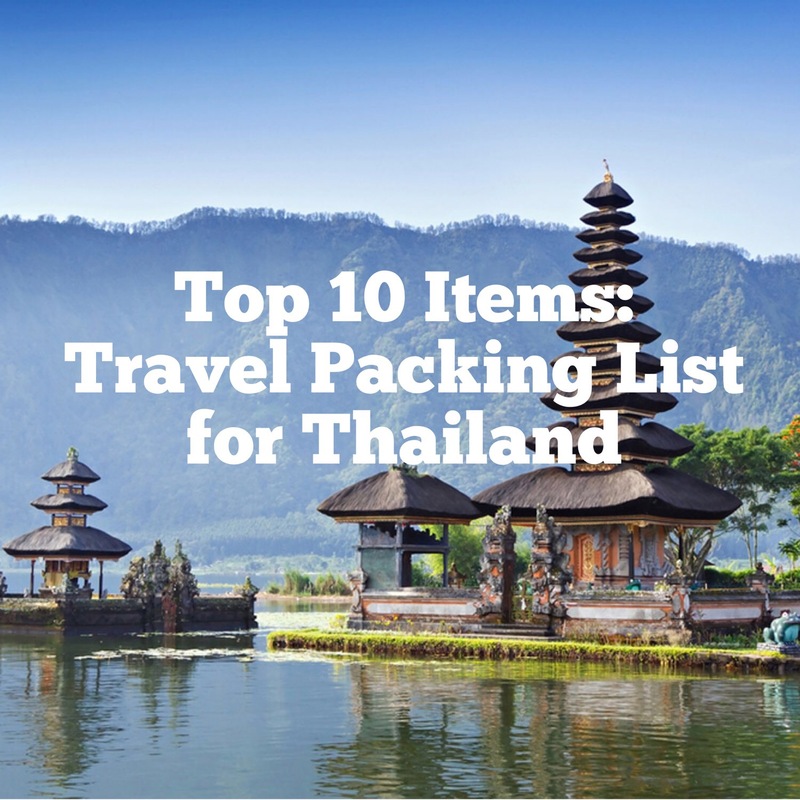 Here are 10 essential items for your Thailand packing list. These are items that you should definitely buy in the States and bring on your trip. 1. Mosquito Repellant. Whether you choose a repellant with DEET or a natural oil to keep the mosquitos away, bring it with you. The US brands do a better job of keeping the pesky bloodsuckers away than the Thai brands. 2. Sunscreen. Especially if you are wanting an oil-free sunscreen, buy your favorite brand at home. The sunscreen in Thailand is fine, but just as expensive for a generic quality. 3. Ziplock bags. Use them as packing cubes and to help separate your clean clothes from your dirty laundry. It will also keep all your things dry if your bags get rained on! 4. Warm jacket/fleece. Planes and trains can get really cold. Some restaurants and hotels also blast their A/C, so bring a warm jacket/fleece to stay warm. Sweaters and jackets are not as easy to find in Thailand’s hot climate. 5. Tissues. There is sometimes no toilet paper in the bathrooms, so pack a few travel packs of kleenex to keep in your purse. It really comes in handy! 6. Hand Sanitizer. Some places don’t have soap. You’ll want to make sure your hands are bacteria free! 7. Locks for your luggage/backpack. Better safe than sorry, my motto is: if they are going to steal my stuff, they are going to have to earn it! Bring a lock for your luggage/backpack. Some hostels will even have lockers. So bring one to put on that as well. 8. Feminine products. Tampons are not as readily available nor cheap. Bring your favorite brand from home. If you are adventurous, try the Diva Cup a few months before traveling. 9. Waterproof windbreaker. It does rain sometimes. This is perfect for keeping yourself warm and dry. You can buy an umbrella over there if you really need one. 10. Parasite pills. I get these from my nutritionist. These saved my stomach! The food is different and depending on your tummy, you will want some sort of supplement to keep the parasites away to prevent any diarrhea and indigestion. 1. Sunglasses. You can find cheap fake name brand sunglasses everywhere. Traveling will scratch up your shades, so leave your nice pairs at home. 2. Sarongs. You find them in a wide array of vivid colors and beautiful designs for only a few dollars. They have many uses: covering your shoulders at a temple, laying on them at the beach, wearing them as a skirt/dress/scarf, using it as a sheet to sleep on. 3. Waterproof bag. They run about $10. If you plan on going snorkeling or any kind of boat trip, this is essential to keep your things dry. 4. Flip flops. You will have to take your shoes off at the temples. The pairs that look most expensive get stolen, so buy a cheap pair of flip flops (easily available) and wear those during your trip. 5. Aloe Vera. Available at any pharmacy, aloe vera is only a few dollars and will save you the packing space. Subscribe to my blog for more travel tips. And please share below any other essential items you would want to take to Thailand! What’s your must-have item?